Only 2 posts for April. I can't believe it....where did this month go? When Barb and I go to Gulf Shores, Alabama to "our" beach house we take a day and drive to Pensacola, FL. It's about a 45 mile trip one way but after driving 900 miles to get to the beach what is 45 more? We save this day to visit Needle Delights, the local cross stitch shop. We pick out linen and patterns to stitch during our stay at the beach. Barb is stitching the above piece. It is a Workbasket pattern...their freebe. Barb is stitching hers on 20ct Cappuccino linen by Weeks Dye Works. She hasn't stitched on this large count linen before and is finding she loves it. She's using 3 strands of floss. My choice for the week is one by The Sampler Girl. I loved the saying and all of the nautical elements. I'm stitching it on 28ct. Parchment by Weeks Dye Works. Both samplers have progressed a bit....I will take pictures again so you can see how they are coming along. Great way to remember that special trip. 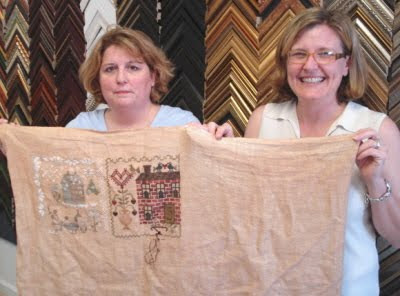 Kathy, the owner of Needle Delights is on the left. Tonia her right hand gal (and framer) is on the right. Kathy ran home and brought back this piece for us to see. She is stitching the Anniversaries of the Heart on 20ct linen by Weeks Dye Works. This piece took our breath away. Makes me want to do mine on 20ct now too. I can just see it over my fireplace. It will only cost about a million dollars to frame....but great way to spend a million. I wish we had taken a picture of Tonya's project. (Tonya...if you are reading this send a picture!) She is working on the Christmas Village by Kathy Barrick. Stunning to say the least. On the quilting front....Barb and I are in the final proofing stage of our newest book Country Inn. It should be going to the printer next week and will be released at Spring Quilt Market. Barb and I are leaving this weekend for Stitchville USA. We are running around like crazy getting all the details finished for the weekend. Can hardly wait to get there and see everyone. Oh I love both your WIPs! And the Anniversaries of the Hearrt too, of course! Good luck getting everything done and have fun at Stitchville! Well, March Anniversaries of the Heart showed up in my LNS. Now is there any chance on seeing part 6 of the Loose Feathers from last year sometime soon????? Both of your projects are beautiful! I love the tulip in Barb's project! I stitched Tanya's Return to the Sea and loved every minute of it. Yours will be gorgeous I'm sure! All-round gorgeous stitching, wow! Have a great time at Stitchville, wish I could be there. Luv'n the sweet Alabama sticherie. Got to have that. Please tell Kathy I said hello! Hope you are enjoying it down there. Love both of the stitcheries you are working on. I can't wait to see what will be in the new book. Hi Alma! Can't wait to see you and Barb again. I'm counting down the days /hours until the Stitchville retreat starts! Beautiful WIP pics! I have Tanya's design in my stash... seeing it makes me want to grab it out again. I love love love the Anniversaries of the Heart wip on the 20 ct! cette tulipe est superbe ! I love the Anniversaries of the Heart series! I've already got the first two and will soon be getting the third one. Wonderful set! I love patterns with houses. Everything is so beautiful, gosh I really am inspired by all these lovely pieces of work!! You girls are amazing, where do fit it all in? lol!!!!! Do you know where I can possibly find that Workbasket pattern online? It doesn't seem to be up on their website. What is it called? It's gorgeous. And the Jane Austen one as well. I wish I could go to the quilt market to see all of the great work that I know will be there! Alma and Barb, you are both such an inspiration! Just talked to Kathy from the shop about the 20 count linen. It's not what I would have chosen but it is too much fun to try something new. Do you girls rent the beach house? You are lucky if you do! I wish I had a beach house like that to go to, with a screened in porch - God, would love to stitch outdoors sans bugs!! Love your pieces too - just lovely fabric you are working on - will have to check out WDW next. How beautiful! 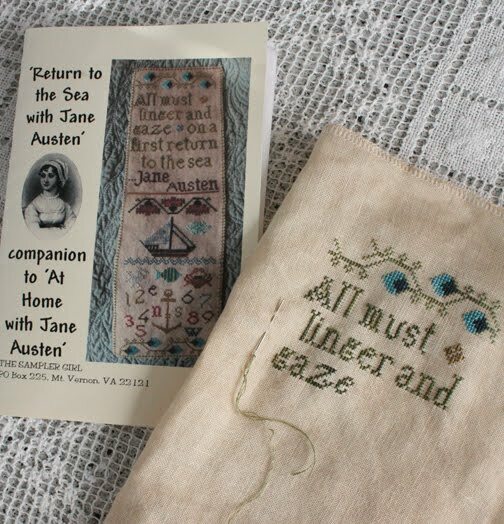 :) I love the Jane Austen piece! :) I might have to find that for myself! ;) Sounds like you had a wonderful time. Also, have you been to Appalachicola, FL!?! That is a beautiful little town and the Owl Cafe has WONDERFUL crab quesadillas!! YUM! Just thought I would share that! oops! 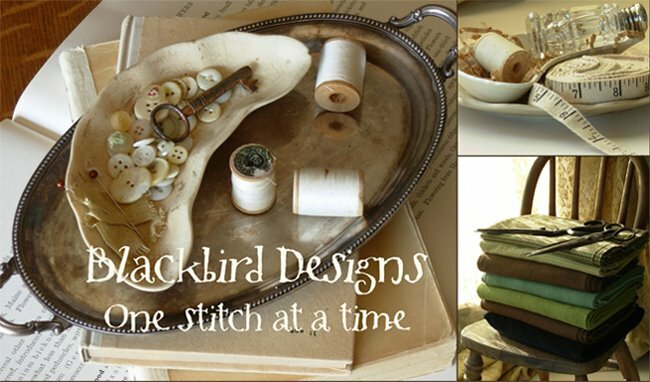 Also a HUGE fan of Blackbird Designs! Can't wait for the new quilt book - I love them all. 20ct linen looks interesting so I may have to try this also. Do you work over 1 or over 2? What could be greater than stitching at the beach in God's Country : > )!! Love Needle Delights--Kathy is great isn't she?!! Is there a link you could provide me with please for the lovely 'Workbasket' freebie that Barb is stitching? I've been to their website, but I can't find it. We are a group of French and we'll start a SAL "anniverseries of the hearts." We all want the same embroidery on one piece of canvas, would you kindly advise us on the color of the canvas or zeigwart DMC are trademarks found in Fance. Trying to find the Workbasket freebie as well - any info you can share? Thanks! Loving the anniversary series. Hope to pick up the pattern and supplies for March tomorrow. I think we are going to have to get the information from Alma and Barb. I contacted a lady who has all of the workbasket magazines but she said they stopped producing them in 1996. Sort of a mystery! it's a dream for me: taking a class with you! The freebie by Workbasket is really a cute pattern and I've just posted on my blog the same pattern I've stitched for a pinkeep. L'ouvrage présenté sur la photo du blog n'est pas de la même couleur que celui sur la grille acheté qui est plus gris ... pourquoi ? I am interest in the workbasket project. I love it, but can't find it. Thanks for any help. I also would like to get my hands on the Workbasket freebie, Pink Flower, I've also being looking for it! Hi Alma, I just received your 2011 calendar in the mail (my birthday present to myself). It is wonderful! Also could you email me the strawberry chart that is missing from Joyeux Noel? I am continually amazed with the design ideas you present. Both of these cross stitch pieces are quite lovely. I have not been able to locate the "Sweet Home Alabama" freebie pattern from Workbasket. It is a gorgeous piece and being an Alabama native, I would love to add it to my needlework collection. Do you know where it can be obtained? Have tried numerous sites thus far with no result. Your blog is always a joy to browse through. Thank you for designing and sharing your talents with us! I too have become enchanted by the Workbasket design, and would love to add this to my collection of Workbasket designs. I just love the freebee from Workbasket. How can I get it? I am also a long distance customer of Needle Delights (just love this shop). I followed the link Kathy posted to your blog. I would be thrilled to get a copy of your border and the words "Sweet Alabama" to compiment the free chart from Workbasket. I hope this is the right way to request this. 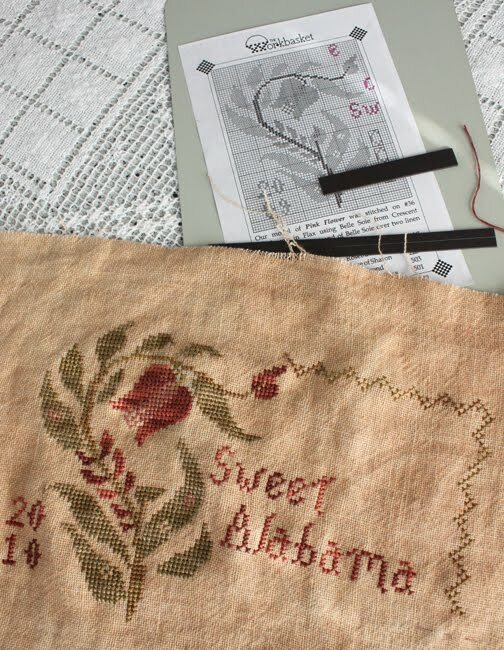 Would it be possible to get the pattern for the border and words "Sweet Alabama"? Your new book is wonderful! and full of sweet surprises! Great job! the both of you are such talents! I can't wait to see what you do next.